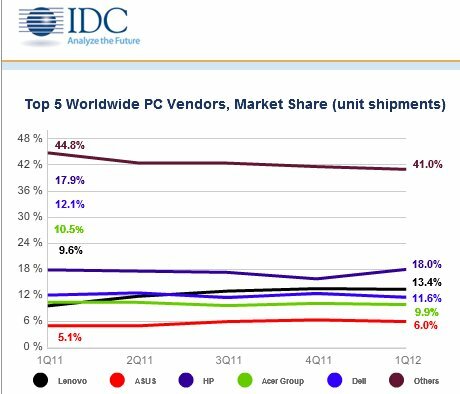 The worldwide PC market saw a slight increase in volume during the first quarter of 2012 (1Q12) compared to the same quarter in 2011, with shipments rising 2.3%, according to the International Data Corporation (IDC) Worldwide Quarterly PC Tracker. The results are slightly above IDC's February projections of a 0.9% year-on-year decline due to hard disk drive (HDD) supply constraints in addition to weak economic conditions, competition from other devices, and uncertainty about Windows 8. HDD supply remained a key constraint through most of the first quarter, although PC makers generally had better access to drives than customers in the retail and distribution channels. As a result, large PC vendors were able to maintain shipments by managing inventory or absorbing price increases, while the impact to shipments from smaller PC makers was in line with expectations. "PC market growth remained limited in the first quarter as HDD supply and other factors limited demand," said Loren Loverde, IDC vice president of Worldwide Consumer Device Trackers. "Nevertheless, history has shown that periods of slower growth are followed by recovery as improving technologies make replacements as well as new purchases increasingly compelling. As a result, we expect PC shipments to pick up significantly by the fourth quarter and beyond as HDD supply and pricing are normalized, Windows 8 is launched, and replacements pick up. "Slow growth in the U.S. shows that despite interesting and new form factors like all-in-one (AIO) desktop PCs and Ultrabook– class notebook PCs, the market remains conservative and focused on replacements. Commercial buyers are still cautious, while consumers are evaluating multiple products and may be waiting for the release of Microsoft Windows 8 later this year. The U.S. PC market is likely to remain constrained at least until the launch of Windows 8, which is expected in the fourth quarter of 2012. We expect vendors, retailers, and channel partners to be working very hard this year to focus their product lines and their general operations as they prepare for the year-end holiday season, because that alone will likely determine if there is any growth at all in the U.S. market in 2012." United States – As expected, the U.S. market continued to exhibit weakness with shipments inhibited by saturation in the consumer market and low refresh rates in the commercial sector. Shipment growth of 1% over the first quarter of 2011 was in line with IDC's forecast of 0.6% growth. The quarter's performance reflects ongoing market changes as consumers consider the forthcoming release of Windows 8 amid competition from media tablets and a slow economy. EMEA – Despite the region's sustained economic uncertainty and debt crisis, the Europe, Middle East and Africa (EMEA) PC market experienced a rebound, returning to positive growth again in 1Q12. The market benefited from a more favorable year-on-year comparison versus the first quarter of 2011, when sell-in was adversely impacted by high inventory levels. IDC expected softer results in 1Q12 in light of the HDD shortages following the flooding in Thailand. However, both mature and emerging markets showed stronger than anticipated performance, driven by accelerating portable PC sales in particular. Japan – Buoyed by robust enterprise activity, Japan saw decent growth in the first quarter. Japanese vendors also fared better than in 4Q11 in dealing with the shortage of HDDs. Moreover, consumers continued to be receptive, and helped the market to surpass forecast. A/PeJ – Asia/Pacific (excluding Japan) (APeJ) was in line with forecasts, though growth was limited. Hard drive supply issues contributed to limited shipment growth, although key countries like China and India, and vendors such as Lenovo and ASUS, continued to fare well. HP – The top vendor managed to shake off the decline it experienced last quarter, growing 3.2% compared to a year ago. HP was able to gain back share in key markets in the U.S. and Europe while other markets saw slower growth. Lenovo – Lenovo has managed to capitalize on the missteps of others in the PC market. The company has continued to expand its channel reach in the Americas and Europe, while still gaining ground in Asia/Pacific. Overall growth above 40% was well ahead of the market and other competitors as Lenovo leveraged its strong results across the regions, building on its strong growth in recent quarters. Dell – Dell saw gains in EMEA, but declines in other regions, which resulted in a decline of 2.1% compared to 1Q11. Dell faced tough competition and had sizable declines in some markets, as its growth in Asia/Pacific slowed after more than a year of double-digit gains. Acer – Acer's shipments declined 3.7% in 1Q12, trailing the market but improving on the past year. Although its inventory issues have largely cleared, it will nevertheless take some time for Acer to mend its channel relationships as it prepares for renewed demand toward the end of the year. ASUS – ASUS continued to see strong gains in Asia/Pacific and EMEA, which represent the large majority of its shipments. Although its U.S. business barely changed from a year ago, the vendor has stepped in to fill the void left by other vendors, making inroads that it may be able to build on going forward. Toshiba – Toshiba saw solid growth in EMEA and Japan, but its global shipments declined as a result of poor shipments in the U.S.
More detailed marketshare data can be viewed at IDC.